The world's population is on track to spike by more than two billion people over the next 30 years, placing more stress on the planet and its resources. It’s crunch time for geodesign. That was Esri president Jack Dangermond’s message to attendees of the Geodesign Summit held January 23–25, 2018, at the Esri campus in Redlands, California. Dangermond drove home the event’s theme, Resilient by Design, saying that our planet is on the precipice of change that—if unaddressed—will negatively affect the environment, biodiversity, infrastructure, and people’s well-being. That’s why it’s imperative that design professionals work toward creating more resilient, livable communities using geodesign techniques and technologies. Geodesign uses stakeholder input, creative design techniques, rigorous methodologies, and spatial analysis and mapping to find the most suitable, environmentally friendly, and sustainable options for how to use space. Human ingenuity has already led to the era of digital transformation that’s currently changing how organizations—including those that use GIS technology—do business. Cloud computing, big data, the Internet of Things (IoT), artificial intelligence (AI), machine learning, and Web GIS are in the mix, along with a strategic vision on how to bring everything together to achieve a mission. “Integrating geodesign into everything we build requires well-thought-out technologies that work and help people,” Dangermond said. Based on demand from users and partners, we know there’s a tremendous demand for GIS and BIM interoperability,” said Chris Andrews, Esri product manager for 3D. Bringing GIS and building information modeling (BIM) software—often each an island unto itself—much closer together would help the architecture, engineering, and construction (AEC) industry. That’s why buzz is building over plans to integrate BIM and GIS data and workflows. 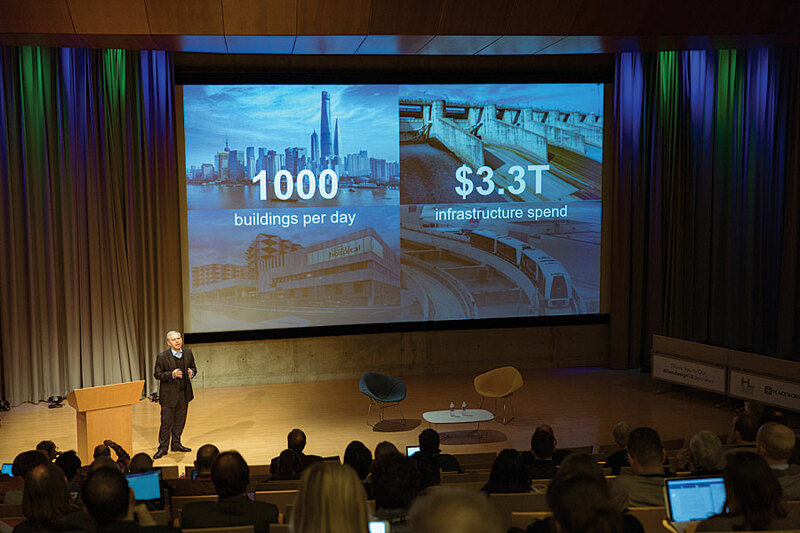 Late last year, Esri and Autodesk announced a strategic partnership to better connect the BIM and GIS platforms, with the aim of giving AEC professionals the ability to create better, more efficient, and sustainable designs, especially in 3D. Autodesk develops software for the AEC community, such as Revit and AutoCAD Civil 3D, which are used by architects and engineers to design real-world assets according to BIM patterns and practices. 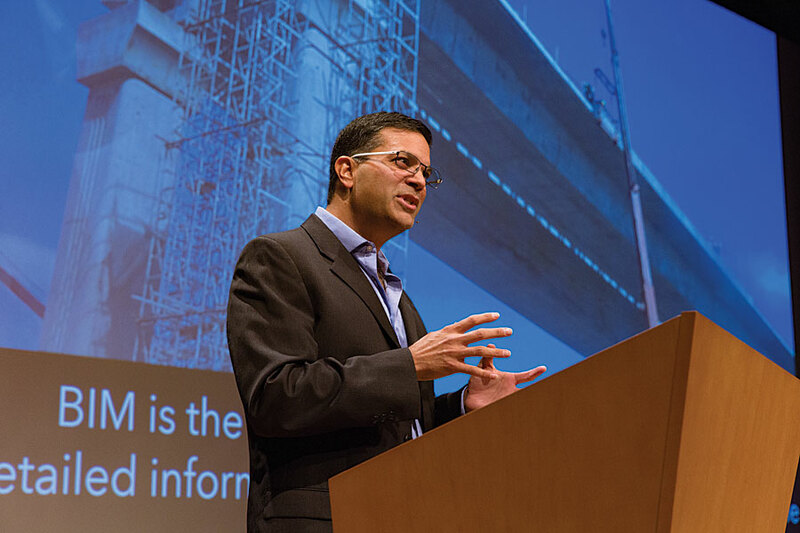 Theo Agelopoulos, director of infrastructure strategy and marketing at Autodesk, emphasized the need to eliminate the existing barriers between BIM and GIS and improve the user experience. BIM users can work with GIS data, and GIS users can work with BIM data now, but the process was described by Autodesk’s Theo Agelopoulos as “painful.” He says that will change. The AEC industry needs to be patient, however, because the integration will take time and be incremental, though there are plans to integrate ArcGIS Online into Autodesk’s InfraWorks software later this year. Christine Wacta is a professor of architecture at Savannah College of Art and Design (SCAD) in Savannah, Georgia, and a PhD candidate in geospatial information science whose work focuses on BIM and GIS. She believes BIM and GIS should work hand in hand. 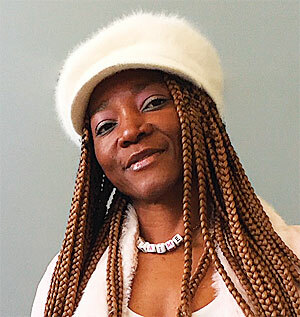 One person who looks forward to a connection between BIM and GIS workflows is Christine Wacta, a professor of architecture at Savannah College of Art and Design (SCAD) in Savannah, Georgia, and a PhD candidate in geospatial information science. Wacta said her PhD studies focus on BIM and GIS. Wacta said that she has advocated for using GIS in her architecture classes and has taught her students to use Esri CityEngine to create 3D models from 2D GIS data. Her students have used both Esri and Autodesk software in their architecture courses. Models created with Esri CityEngine give architects and urban planners a realistic view of their projects, helping them see where a building that is proposed might cast shadows, reflect heat, or even block views for nearby residents. 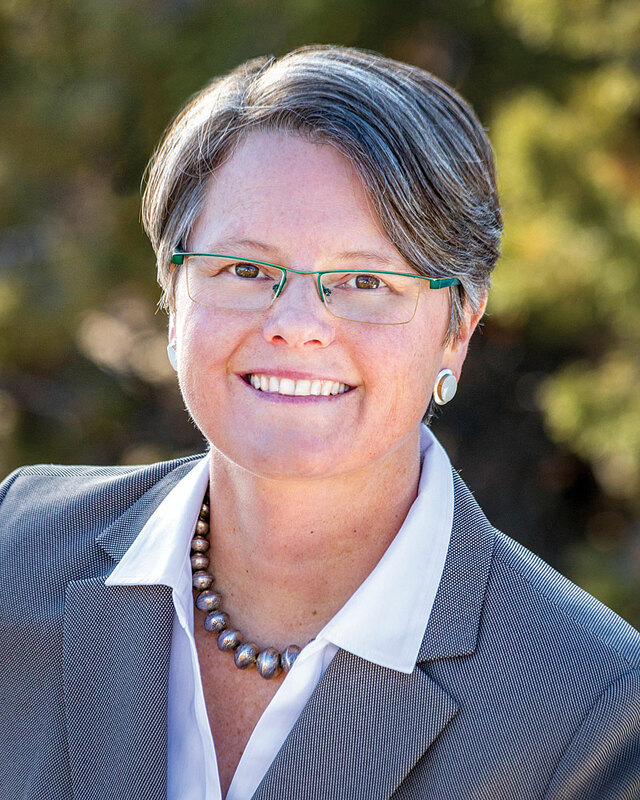 Breece Robertson, the director of planning and GIS for The Trust for Public Land, works on programs that create green infrastructure to help reduce the impact of climate change. 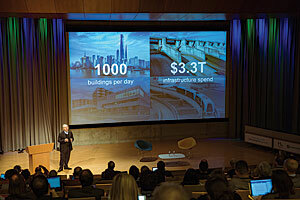 The summit delved into many aspects of geodesign and supporting technology and content. Geodesign benefits from communities’ having access to data and apps that they can use to develop green infrastructure plans. One TPL program, Climate-Smart Cities, aims to create green infrastructure to help reduce the impact of climate change. One of the program’s projects is Green Alleys. TPL reports that there are 900 miles of alleys in Los Angeles. The Green Alleys project transforms uninviting, concrete alleys into safe, green, community spaces. Working with a decision support tool that uses ArcGIS technology—and factoring in other information and community input—TPL identifies areas that would benefit from green alleys. Not only are the alleys cleaned and spruced up with greenery, but the impervious surfaces are also removed and replaced with pavement that reflects light and is more permeable. This helps to keep the alleys cooler and reduce the runoff of water into storm drains. The Green Alleys project, sponsored by The Trust for Public Land, transforms uninviting, concrete alleys into safe, green, community spaces. 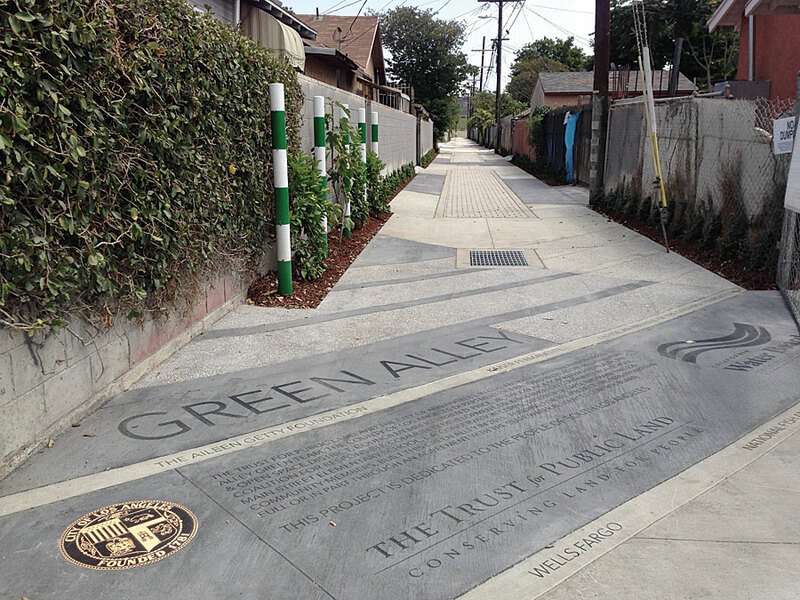 The Green Alleys project illustrates the Geodesign Summit’s focus on sharing ideas on applying The Science of Where—the science of geography and the technology of GIS—to make better design decisions. Though the challenges seem daunting, Dangermond said he sees reasons for being optimistic. “We can make a huge impact on the way it turns out, because human ingenuity will kick in, and we will create a sustainable future,” he said. Esri writer Matt Ball contributed to this article.